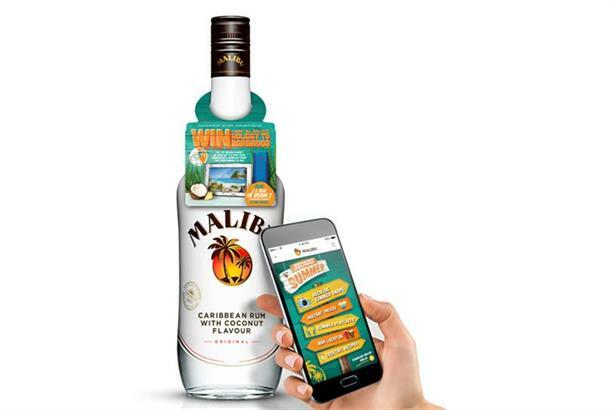 Pernod Ricard's coconut rum Malibu is embracing the idea of connected products on a scale not seen before, with the release next week of 40,000 near field communication-enabled bottles. Exclusive to Tesco, the bottles feature a tag hidden behind the bottle’s palm tree logo. Malibu said the number of units being produced makes this largest global deployment of NFC on a consumer product in alcohol to date. When a user taps the logo with an NFC-enabled Android phone, they are taken to an exclusive microsite, featuring pieces of content designed to augment the consumer experience, with no need to download an app. The content includes an online playlist, cocktail recipes, a bar locator, a instant win competition for a pair of speakers, and a user-generated content competition to win a holiday to Barbados. Each bottle comes with a neck collar, explaining how to use the tag. iPhone and Windows users can access the same content by entering a short web address. The campaign was developed through an on-going partnership with creative agency SharpEnd, and follows work undertaken at the Stockholm lab of The Absolut Company, the division of Pernod Ricard that makes Absolut, Malibu and Kahlua. According to Malibu marketing manager Jo Alexander and SharpEnd’s founder Cameron Worth, a number of factors meant the time was right for a widespread use of connected bottles. "From a consumer behaviour point of a view, they’re becoming much more au fait with using contactless tech," said Alexander. "Whether it’s debit card, Oyster card, the behaviour of tapping is something that’s become more and more ingrained in your everyday life." Worth said that consumers would not be willing to engage with technology built until a bottle unless the experience was seamless – a problem that faced QR codes, which many users found more complicated than simply entering a web address. "We identified the main barriers: the need to download an app, the fact that QR codes were quite aesthetically displeasing," he said. Worth added that on-bottle technology had the potential to create many ways to improve the brand-consumer relationship. "Absolut on a global level produces 200 million bottles, but at the moment we lose control of those as soon as they go into the supply chain," he said. "Once the bottle becomes a media platform there are so many different things that can be delivered that are beneficial to shoppers. "This provides an entirely new way to communicate with them and brings Malibu directly in front of its target audience, presenting the opportunity to drive brand loyalty through service delivery."